It's not the prettiest book on the shelf. The cover isn't designed by Randy Mosher. The prose isn't Michael Jackson. But author Kevin Revolinski, The Mad Traveler, knows about getting from Point A to Point B and what to see and do along the way. 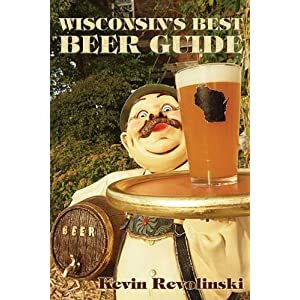 Wisconsin's Best Beer Guide has been around for a few years now. First published in 2004, it was a comprehensive snapshot of Wisconsin brewing. Well, a lot has changed in the intervening six years, so it was time to update the book. Filled with the basics on beer, where the book really shines is its sheer comprehension and user-friendliness. Kevin spoke with almost every brewer at every brewery and brewpub in the state. The book is filled with their inside scoop on which beers are their favorites, and when to visit, and what the secret handshake looks like to get a discounted (or free) beer and tour of the place. Hint: the handshake looks a lot like showing a bartender the book and slyly asking if the brewer is around. It's funny. As I talk to brewers around the state, they all seem to mention this book. I don't know why that is. Like I said, it's not much to look at and Kevin, while knowledgeable, isn't exactly Michael Jackson. But what does work, is its pure functionality and Kevin's enthusiasm for the subject. He treats every brewer and brewery the same. New Glarus and Granite City get the same number of pages in the book as Stonefly and Northwoods Brewing. Along the way, Kevin provides some excellent travel tips that include when and how to get there, interesting beer sites along the way, and what other beer-related stuff might be within stumbling distance of the brewery. Few people are going to read this book cover-to-cover. But put it in your car next to the Wisconsin map and when you find yourself on a family trip, or just out to kill a day, look up your area and Kevin will point you in the right direction. Do that a few times and with the discounts in the book (seriously, I wasn't kidding about the free beer handshake) you'll easily make up the $12.99 you spent for this great guidebook to Wisconsin Beer. After reading this, I immediately bought a copy. Great review! Awesome! I'm glad to hear that people out there are supporting our local authors and beer.